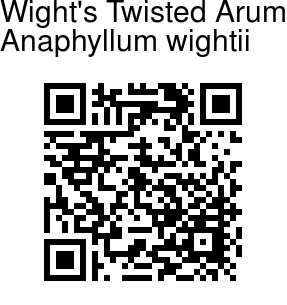 Wight's Twisted Arum is a tall herb with creeping rhizome. Leaves are pinnately cut or pinnately lobed, lobes 3-8 pairs, 20-28 x 5-10 cm, usually narrower, elliptic to oblong, tip pointed, stalkless or petiolulate. Leaf-stalk is 60-150 cm long, erect, 5-10 cm thick, smooth or transversally rugose, brownish. Spadix is 15-30 cm long, 5-8 cm broad. Spathe is open, deep brown, once or twice twisted. Spikes are 4.5 cm long, 8-10 mm thick. Flowers are bisexual, densely arranged, 3-6 mm across; tepals 4, obovate, flat; stamens 6, free, filaments broad; ovary 1-celled, ovule solitary, style short, stigma discoid. Fruit is a spherical achene. 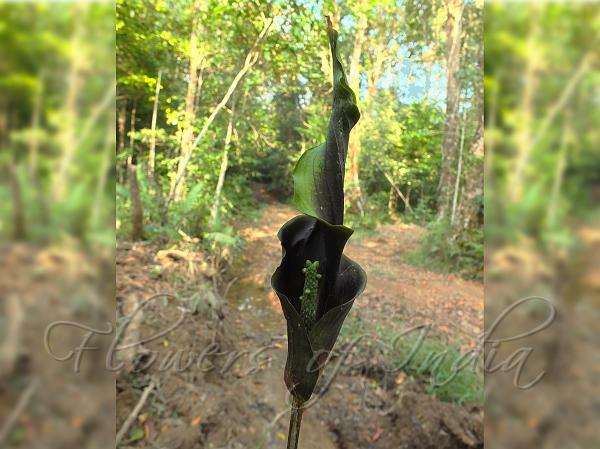 Wight's Twisted Arum is endemic to Southern Western Ghats. Flowering: January-February. Identification credit: Siddarth Machado Photographed in Brahmagiri Range, Kodagu, Karnataka.